It's About Time You Schedule Your AC Services! | AAction Air Conditioning & Heating Co.
Perhaps the most important reason to get ahead on your air conditioning services is energy efficiency. When your AC is efficient, you will spend less time worrying about costly repairs and sky-high energy bills, and instead, worry about planning the perfect beach vacation. In fact, it has been estimated that your air conditioner losses 5% of its initial energy efficiency for each year that it misses maintenance. So when you schedule your services regularly, your system will retain 95% of its initial efficiency. Why pay more than you have to for comfort? During your maintenance visit, your technician will thoroughly inspect your system for any signs of an issue and make adjustments to enhance performance and efficiency. So, what are you waiting for? Schedule your services today! You want to be sure that during a hot, Georgia summer you are able to find some relief. Therefore, you depend on your AC a lot to keep you and your family cool and comfortable, especially during a heatwave. But, if your system has not received an annual inspection and tune-up, you can’t be sure that it is equipped to do its job throughout the entirety of the summer. Annual maintenance ensures that your system is reliable. Trust us, the last thing that any homeowner would want to face during the summer is a system breakdown. Your AC technician will ensure that there are no issues looming, and if there are, he or she will fix them accordingly. 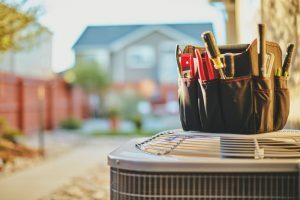 Far too many homeowners wait until the last minute to schedule their air conditioning services, leaving HVAC technicians quite busy answering dozens of service calls. Though this is great for business, it can make it quite difficult for you to schedule an appointment that works for you. When you schedule your services ahead of the summertime rush, you can be sure that you’ll find an appointment that is convenient for you. Plus, early maintenance ensures that there is plenty of time to take care of any repairs should your technician find any issues during inspection. This way, you’ll enter summer knowing that your system is equipped to handle all of your cooling demands. To schedule your air conditioning maintenance services with one of our expert technicians, contact AAction Air Conditioning & Heating today.